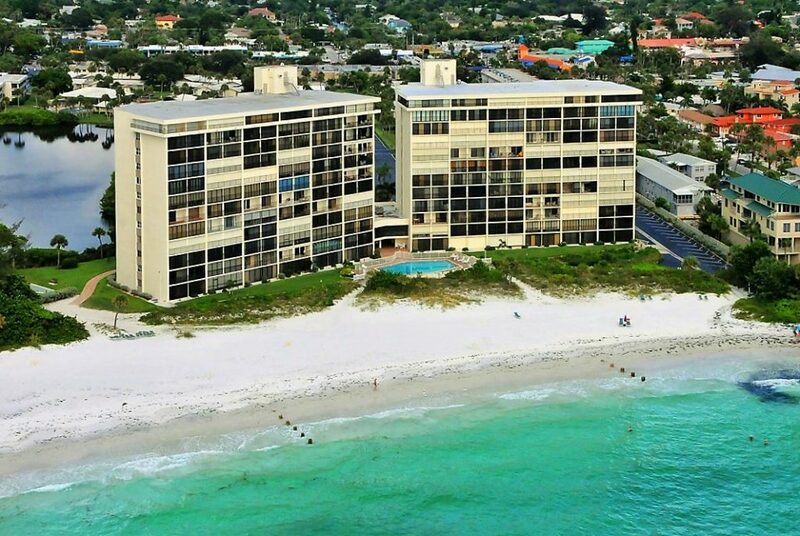 Whispering Sands is located on the Gulf of Mexico and steps from the Village. The community includes a total of 267 units, with 144 condo units situated in two towers directly on the beach. 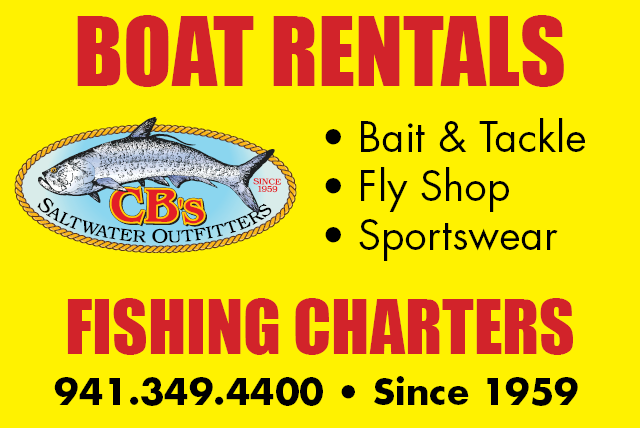 The grounds have a large natural lagoon, two swimming pools, clubhouse, and tiki hut. Whispering Sands is only one of two 55-and-up communities on Siesta, with Siesta Harbor, located mid-Key, being the second. The rest of the Whispering Sands community is comprised of three mid-rise buildings overlooking the lagoon, and multiple villas with attached garages and washer/dryers. 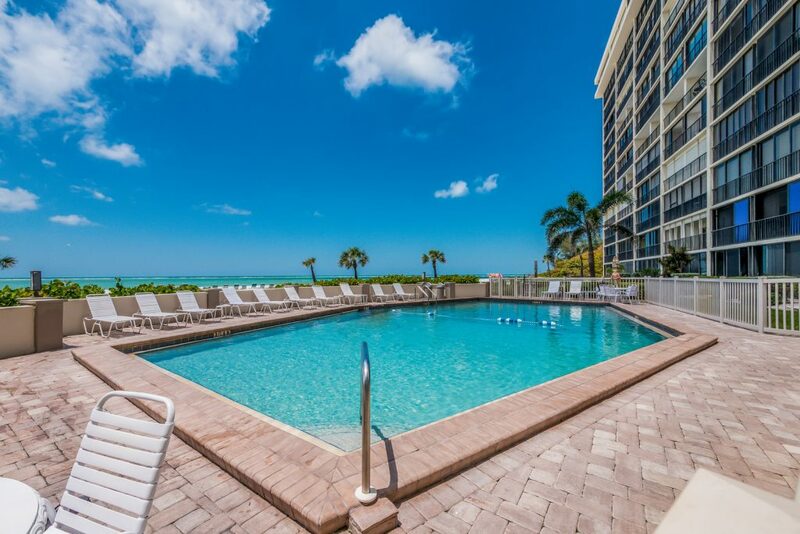 Amenities include a clubhouse, two pools (one overlooking the Gulf), fitness room, kayak racks, paver-lined shuffleboard area, and other amenities. For Debi Burnett, who has owned a villa unit since August, 2013, it was Whispering Sands’ excellent location that drew her to the community. Recent sale prices, and listing prices, have been steadily on the rise over the past two years in Whispering Sands. Back in June, 2016, for example, a sale on the high end came in at $615 a square foot for a renovated two-bedroom tower unit; while a year later, a sale of a comparable two-bedroom, renovated unit sold for $661 a square foot. In January, 2018, a two-bedroom penthouse tower unit sold for $945,000, or $761 a square foot. “It is a highly desirable community for seasonal and annual residents with close proximity to the village and its own private beach,” says Realtor Bob Ruiz, who has a two-bedroom, renovated tower unit listed for sale. “On-site management does a great job of ensuring the property is always at its best,” Ruiz added. The community has a two-month minimum rental requirement. As a result, it is not at the top of the list for rental investment properties, Ruiz says; however, it does rent very well for those who wish to rent out units as seasonal rentals. With the two-month minimum rental policy, the community doesn’t have the busy, transient feel of a resort condo, Burnett adds. “Our community is really, really quiet,” says Burnett. “There is a strong sense of camaraderie.” For instance, Burnett says, there is water aquatics and the same women attend; as well as a monthly women’s social. Whispering Sands has a private beach with amenities such as beach chairs. “I take my paddle board right off the beach,” says Burnett. The owner from Delaware says the villas have a house-like feel. A plus is how the villas include an attached garage for ample storage and a washer and dryer setup in the garage. In addition, most of the villas also have a lanai and porch where owners can grill. 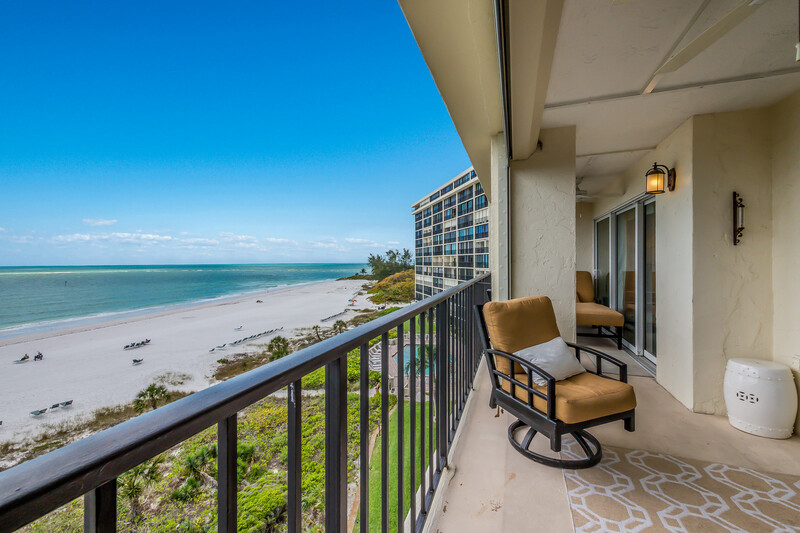 Residents of the towers enjoy water views of New Pass and the Gulf of Mexico by day; “sunset views, for which Siesta Key is so famous,” by evening; and the lights of downtown Sarasota and Lido Key by night, says Ruiz, of Key Solutions Real Estate. The mid-rise units have water views of the lagoon, and though the villas are not true view units, owners can take advantage of the water views — both Gulf and lagoon — on the property, Ruiz adds. Six units in Whispering Sands have sold over the past year, and six units are currently listed for sale. According to MLS, four of the units on the market are two-bedroom tower units — listed between asking prices of $799,000 to $925,000. A fifth tower unit is listed for $1.7 million. That four-bedroom unit is comprised of a pair of two-bedroom units that were combined on the first floor. One mid-rise unit is also listed for $405,000. Recent sold units in the towers sold for $562,500 to $945,000. And a mid-rise unit sold for $412,000 in May, 2018. The two-bedroom, sixth-floor tower home currently listed by Ruiz for $925,000. At 1,282 square feet, the listing comes out to $722 a square foot. “The renovation was completed by the current owners and is exquisite,” Ruiz told Siesta Sand. 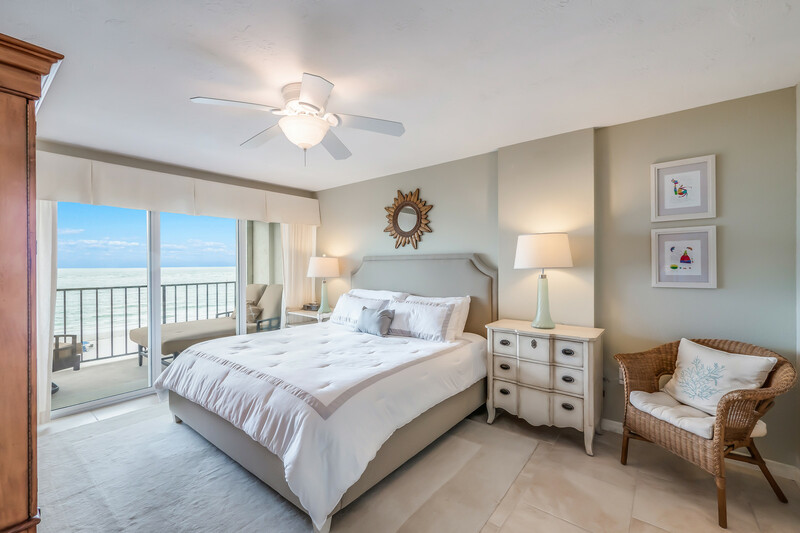 “The unit is exceptional in that it is open, light, and bright.” The best feature, however, is the Gulf views. 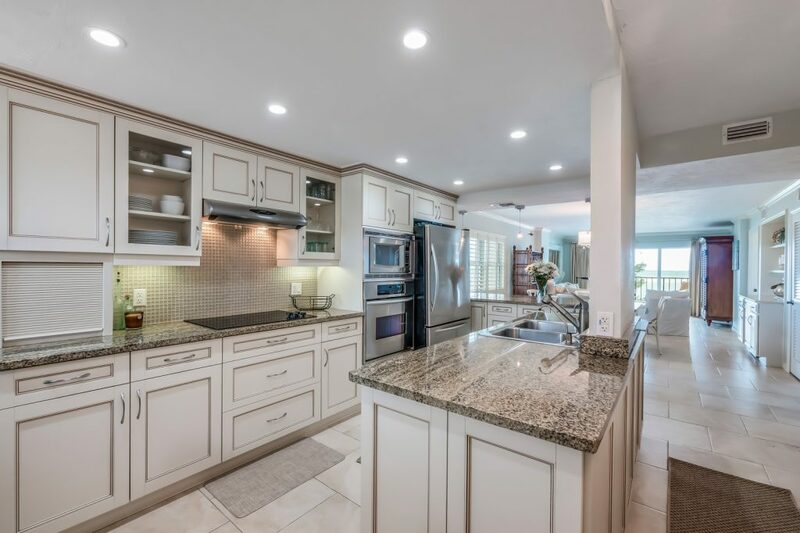 The open kitchen features white wood cabinets, granite countertops, stainless steel appliances, a closet pantry, and a corner desk. Both contemporary bathrooms feature wood vanities, with stone countertops. Expansive new hurricane shutters and windows allow for an abundance of light and, combined with the open floor plan, present views from virtually everywhere in the unit. In January, 2018, a two-bedroom tower unit sold for $945,000, or $761 a square foot. This 12th-floor penthouse unit was recently renovated to include tile flooring, white plank ceilings, and crown molding throughout. It has western facing Gulf views.